Leigh Stringer is back to explain the importance of Harvard‘s Health and Human Performance Index, a new measuring system for well-being. Image courtesy of Drew Donovan Photography. At the Tradeline Space Conference in Boston this May, I got the chance to share some work my firm, EYP, is doing with Harvard University’s School of Public Health, piloting a new measuring system for well-being: the Health and Human Performance Index (HaPI). In this latest premium offering, we’ll explore what it is and why it matters. What is the Health and Human Performance Index? The HaPI index was developed in 2012 by Harvard in partnership with Johnson & Johnson (J&J) is being championed by Dr. Eileen McNeely, Co-Director of Harvard’s Sustainability and Health Initiative for a Net Positive Enterprise (SHINE) at the School of Public Health and the index’s principal investigator. J&J, Owens Corning, Levi Strauss, and EYP are some of the organizations in the process of “piloting” the HaPI index in order to roll it out over the next few years. Ultimately, the HaPI tool will be a way that companies can compare themselves to others and see how well they are doing on the well-being front. The intent of this tool is to provide the business community with a universal benchmark, transferrable across industrial sectors and global businesses, for communicating how the business impacts employee development and well-being. The index measures a number of parameters, including employee well-being, productivity, engagement and work culture and organization. EYP has been working with Harvard to add a module to the index that addresses the built environment. Well-Being — Provides both affective and evaluative aspects of well-being. Subjective well-being has been associated with overall health and performance. Productivity — Measures the number of employee healthy days and a subjective report of work performance. Engagement — Captures feelings at work (vigor, dedication, and absorption) that have been previously associated with job resources, health, and work performance. Culture — Captures the availability of work resources (i.e. supervisor and coworker support, participatory decision-making, challenges, etc.) that have been previously associated with health and performance. *New Module* Built Environment — Captures the quality of space (type of workspace, thermal comfort, air quality) and access to healthy amenities or opportunities (adjustable desks, fitness centers, shower facilities, healthy food options, views to outdoors, the ability to work at home, etc.). The development of the HaPI tools is particularly exciting to me because it looks at health across silos and organizational boundaries. Up to now, organizations tend to use different sets of tools and metrics to address health. For example, health and the built environment is evaluated by LEED or the WELL Building Standard, comprehensive wellness programs are measured by Corporate Health Achievement Award (CHAA) or C. Everett Koop Award, and job satisfaction and engagement is measured with tools like Gallup’s Q12 survey or Fortune’s Best Companies to Work For criteria. Though there is some overlap between these tools and what they measure, none of them evaluate the entire picture, which can lead to poor decision making. Image courtesy of EYP Inc.
Sleep patterns. On average, EYP employees claim they sleep average of six-and-a-half hours per night on workdays. In addition, they claim that on 12 of the last 30 days resulted in “poor sleep”. Survey respondents were even more likely to say they are sleep deprived if they are female and under the age of 45. Researchers found a connection between an employee’s commute time, the amount of hours they worked and sleep patterns. The longer the commute and the more hours worked, the less sleep the employee is likely getting. Health experts say it is important to get seven to nine hours of sleep a night in order to maintain health and performance. Poor sleep can also lead to increases in stress levels, which bring us to the next finding. Stress levels. The average (mean) number of days employees felt anxious over the last 30 days was 6.5. This number went up for women and younger staff. There are many reasons employees might feel anxious, like lack of sleep, lack of exercise, a heavy workload, or feeling a “lack of control” as to how, when, or where they get their work done. We’ll be exploring these factors in the next phase of analysis. Exercise. Survey respondents were asked, “Over the past 5 workdays, how many minutes have you engaged in moderate to vigorous exercise that temporarily increased your heart rate (i.e., brisk walking, running, biking, etc. )?” The average response was 55 minutes, which is significantly lower than the 150 minutes per week recommended by health experts. Interestingly, early analysis of the EYP data shows a correlation between the amount of exercise employees are getting and office location. Employees assigned to an office with a shorter commute, in an urban location (vs. suburban), access to public transportation, access to a park, and views to the outdoors were more likely to exercise more. EYP’s Boston office. Image courtesy of Richard Mandelkorn Photography. Why is EYP doing this, and what’s next? First and foremost, we are committed to our employee’s well-being. We want to understand how to bolster our current wellness program but also help our managers and teams make informed decisions to improve their happiness, health, and performance. We realize that the architecture and engineering industry is competitive, and we have to work hard to stay ahead. That said, we’re in this for the long game. We want to design our work and our work process to be sustainable — not just environmentally friendly — but with sustainable business practices that keep our employees excited to come to work each day and full of energy when they go home. The second big reason we are doing this is to inform our design practice and to broaden the current thinking about health within the building industry. 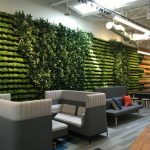 Right now, human health is being addressed in buildings, but primarily as it applies to building safety, air quality, thermal temperature, or ergonomics. But we know intuitively that the physical environment greatly influences our health and well-being in more ways than that. It can encourage us to move, reduce stress, encourages good eating behaviors and much, much more. That said, our industry needs more solid research to prove this out, and ways to specifically show how the built environment fits into a larger framework of health. EYP will be publishing findings with Harvard in the near future and engaging our clients in conversations to advance thinking on health and human performance across different industries. If your organization or one of your clients in interested in HaPI, please reach out to Eileen McNeely. If you are interested in engaging in workplace health research or understanding the benefits of a healthy workplace to your organization, please reach out to Leigh Stringer. We welcome the conversation!